Can I Get Teeth Whitening with Dental Implants in Massapequa? You have taken the initiative to invest in your confidence by replacing your missing front tooth with a dental implant. While you no longer feel insecure about the empty space, a new issue has developed. 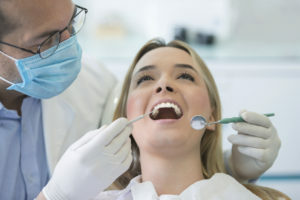 Your adjacent teeth have started to become discolored over the years, causing the crown of the replacement tooth to stick out like a sore thumb. Since porcelain is stain-resistant, it will not lose its bright, white glow like that of your natural teeth. While you want to revitalize your smile, is it even possible when you have dental implants in Massapequa? When replacing your missing tooth, your Massapequa dentist will create the crown to meet your exact specifications. In addition to the size and shape, it will also be customized to match the color of your natural teeth, which is why it is often recommended to have a whitening treatment prior to having it placed. However, even if your implant matched your enamel color, your remaining natural teeth will begin to discolor over the years. Age, poor oral hygiene, and the foods and drinks you consume can influence the severity of the discoloration. If the color differences between the crown and your natural teeth have become too severe, you can brighten your smile with a professional whitening treatment, but it will not influence the color of the restoration. Generally, if you have good oral health and your dental implant has fully integrated with the jawbone, you can benefit from a professional whitening treatment. After an initial consultation, your dentist will create a customized treatment plan. Before you undergo the procedure, a special shield will be placed over your cheeks, gums, tongue, and lips. Then, the whitening solution is applied to the surface of the teeth. A special light is used to activate the whitening agents. Using 15-minute intervals, your natural teeth will become several shades whiter, but the crown’s color will remain unchanged. A professional whitening treatment provides drastic and noticeable results to restore your confidence. However, in some cases, while the crown as lighter before the procedure, it can be left looking darker as your natural teeth are lightened. To blend the appearance of the dental implant with the color of your enamel, your dentist may be able to stain it to make it appear darker. In some cases, you may need to have a new restoration made for a seamless appearance. If tooth discoloration has you feeling insecure about your appearance, your dental implant will not stop you from getting the bright smile that you want. Your cosmetic dentist will help you reverse stains and discoloration to give you the confidence you need. South Shore Dental Care will help you achieve a luminous smile. Our dental team offers specialized solutions to promote the health and beauty of your teeth and gums. If you are interested in reversing tooth discoloration, contact our office today to schedule a consultation. by: Dr. Stutman's Office at November 13, 2017 . Comments Off on Can I Get Teeth Whitening with Dental Implants in Massapequa?